Importing a large number of names can really bog down the server. How much depends on the server hardware, but a realistic expectation is an hour per 10,000 names. We recommend that you do it when other users are not trying to do anything with mSupply! The File > Import > Import customers & suppliers… menu item allows you to import customers and suppliers into an mSupply data file. If you are working in Dispensary mode, this is where you can import patients. J Customer group. If the group name does not exist, it will be created by mSupply on the fly. So, for example, a name which is a donor and supplier would have “DS” or “SD” in the type field. The customer or supplier category1, 2 and 3 fields will be created if they don't already exist. If the name is a customer and a supplier, a customer category will be created. You must always include every column in every import file. For all names except patients, the first 3 columns are mandatory. You can leave the other columns blank and mSupply will only import the information you have provided. See below for more on importing patients. Strip out line feeds and quote characters. You will want to do if you've used Excel to save the text file. Save the template as tab-delimited text (rows end with a carriage return, line feed and columns are separated with a tab character) before importing into mSupply. MS Excel tends to add extra characters (line feeds and quotes), but mSupply will gracefully remove these without complaining providing you select that option -see info box above. When you choose File > Import > Import customers & suppliers… you'll be shown an open/save window where you choose the file to import. Please note that the visibility of any new names created will be subject to the state of the Names created in this store not visible in other store preference (see Virtual stores, the Preferences tab for details) - if the preference is turned on, all new names will be visible in the store you are logged into only. If it is turned off then all new names will be visible in all stores. 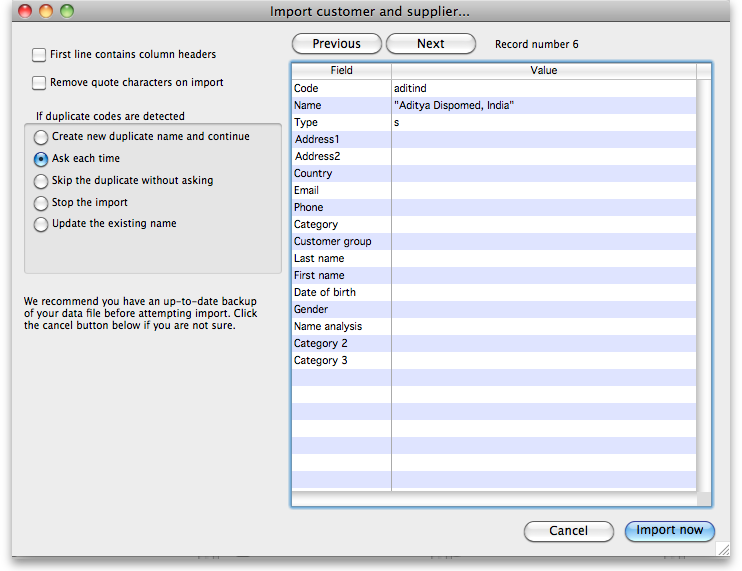 If the first line of your import file contains column headers then check the First line contains headers checkbox. This tells mSupply to ignore the first line and start importing form the second line. Check the Remove quote characters on import checkbox if some of the fields in the import file have had quote marks added to them. This can often happen if you have created the import file by exporting it from Excel or some other spreadsheet application. Now, in the If duplicate codes are selected section, select what you want to happen if a name code is found in the import file which is already used by a name in mSupply. You can use the Previous and Next buttons to go through the import file one line at a time to see what mSupply can see in each field and therefore what it will try to import. Can be useful for checking whether extra quote characters have been added to any fields or if the first line of the text file contains column header information only. If you are importing patient names, leave column B (the full name) blank and make entries in the Last name (col K) and First name (col L) columns. Below is an example of a spreadsheet for importing patients, customers and suppliers which demonstrates how to fill in the fields with respect to each import type. Column K is what defines the difference between a customer and a patient: A customer will have a blank last name, a patient must have a non-blank last name. A customer can have a blank first name.